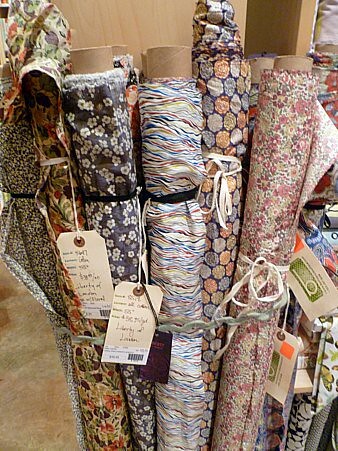 Just In: Rifle Paper Co, wool, eyelet, silk, Liberty of London and more! Just In: Japanese Imports, Art Gallery knit and rayon, African wax prints and more! Looking back on last year I wanted to share some tidbits about 2011. We are so very lucky to have such talented folks live in and around this fine city of Portland. Not surprisingly some best selling items of last year were from locals. 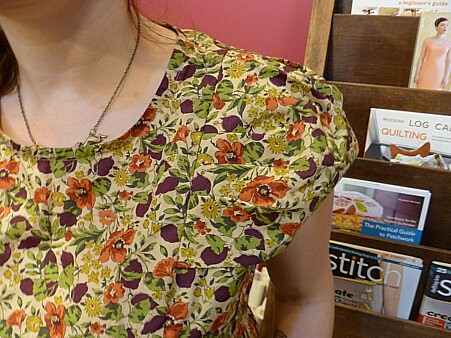 The most popular pattern of 2011 was The Crepe dress by Colette. (Pause for applause and joyous cheering)! 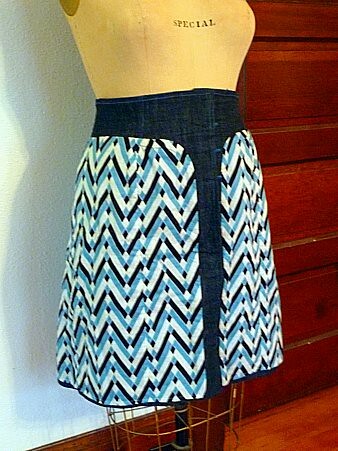 This dress can be sewn up in so many different combinations very dressy to totally casual. I think that is a sign of a great pattern when it can be so versatile……always a hit. Four other Collette Patterns were among the top sellers of 2011, including Negroni, Violet, Sencha and Ginger. 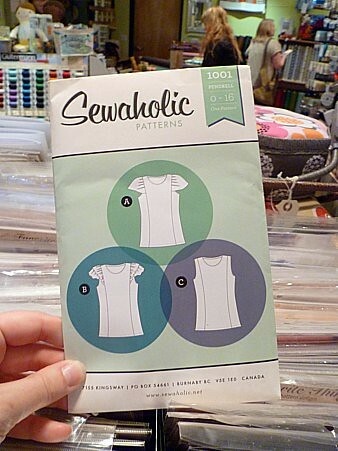 Most of those patterns are labeled as beginner, and we think that is great that so many beginning sewers are taking the plunge into garment sewing. We look forward to seeing some of those finished garments uploaded onto our flicker pool, or shown off in person. In the books category Modern Log Cabin Quilting by Susan Beal got the top pick among our local bunch. The interview with Susan was one of my favorite posts on Bolt's blog last year. I love to see the studios and get an insight into other sewers spaces and places. Another contender was Elizabeth Hartman's A Practical Guide to Patchwork (Elizabeth is coming out with another book Modern Patch Work this year that is on our radar). In case you did not know Elizabeth is one of the stellar teachers down at our sister shop Modern Domestic. You could learn to quilt from the author herself. If you feel like 2012 is the year you are going to do more sewing, or learn to sew, any of these titles would be a great place to get started. If you missed out on any of these great patterns and books, stop by and see what your missing. We're back! Holiday down time has been enjoyed, inventory has been counted and we're ready for a new year. We received some great new pieces on tubes right before we closed up a couple weeks ago. Generally the pieces on tubes are end runs from designers. These tend to be more apparel appropriate fabrics. They're really fun for me to pick out for a couple of reasons. The first being that I have no idea at all what I'll be shown when I meet with my reps and I can imagine these pieces made up into a wider variety of things than the quilting weight cotton prints. The black and cream piece above I envisioned as a vintage Vogue pattern of some sort, maybe a 1940s era design, with simple lines, or maybe the Colette Peony dress or a simple pencil skirt….so many options! A few more interesting pieces—a cream, soft wool with these mauve flowers every so often. I love the combination of a wool with tropical looking flowers. The piece next to it is a two-faced denim and golden velveteen. Oh my. Really, who doesn't want some of that in their life? We just may be seeing a sample whipped up with this soon…stay tuned! We have a number of lovely wools still in stock, many of which would stitch up beautifully into a cozy hooded scarf. Remember that fantastic project? We're excited for this coming year. We have some new things planned and we're bringing back some other things—like the Organization of the Month program. I'll be posting soon about January's organization and how you can help us support them. Happy New Year to you all! I looked in my closet the other day and realized I was bored with everything inside. Don't you hate that! I need a wardrobe boost in the worst possible way. 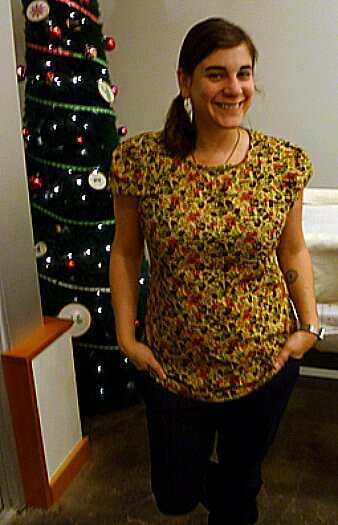 Looking for inspiration in the patterns, I picked up Sewaholic's Pendrell blouse. This one doesn't have ANY closures, similar to my other favorite blouse pattern, Colette's Sorbetto (I have expressed much love here and here). Which really just means it comes together quickly. Perfect! I have been dying to sew with some Liberty of London. Gina has brought in some stunners and I picked up two different cuts. I know they're revered and now I know why--beautiful drape, striking designs, and a pleasure to sew with. Worth every penny for that wardrobe boost. With such a fine fabric, be sure to pick up some Microtex Sharp machine needles to get the best stitch quality. I love the 40's details on the sleeve; the tucks provide a slightly exaggerated shape. And they are set in the princess seam not an armscye, another easy installation. Because of the seams there are no darts! 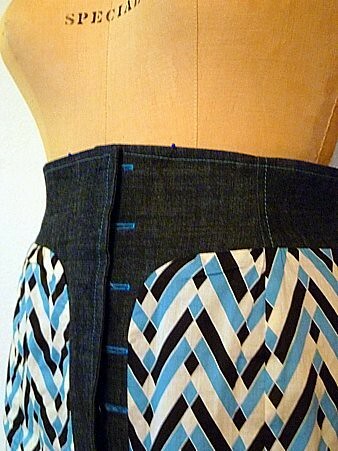 Take your time on the gentle curve of the princess seam to prevent stretch or distortion. If you're nervous, do a staystitch along both pieces first. I was trying to decide what to wear to Colette Pattern's Book Launch party last week. I had every intention of making a beautiful navy Peony dress or remaking the Crepe wrap in our fun denim/hemp blend, but the week simply got a way from me. Which is kinda how I feel about November in general. Anyone agree? I wanted something fun and pretty so I turned to my Beignet skirt. Which is exactly how I feel about it--fun and pretty. The high-waisted style is flattering, as I have just learned over time that while I love those beautiful Japanese styles, I look like I'm wearing a sack. I need waist definition! Here is a pattern with smart details inside and out--side seam pockets, faced waist and button placket with a full lining. For this I chose a Denyse Schmidt voile. LOVE. 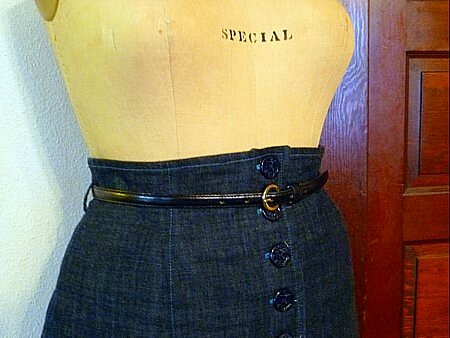 I used a topstitch in a contrast color for a (mock) flat felled look typically found in denim wear and went ahead and stitched buttonholes in the same. Went a little nautical with anchor buttons! 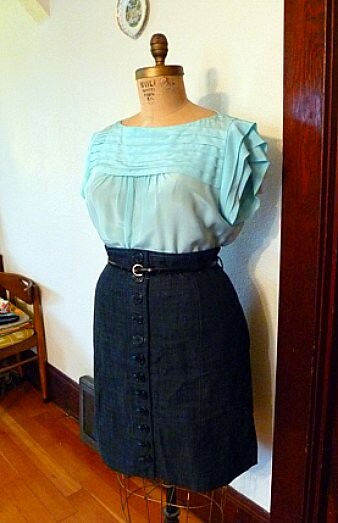 This skirt would be a stunner in a lovely light wool or in a chic black cotton!